Customized Training Services helps to build a bridge between where your business is and where it can go. Our services are great for many levels of schooling, as well as private and public organizations. We create an engaging atmosphere that makes it easy to reach students and employees of all experience levels and backgrounds. We work in many areas of business that usually provide a lot of concern and anxiety for administrators. Resolving a conflict is always difficult, especially in the setting of a small classroom or workspace. We treat every party with respect and listen to their concerns in an attempt to understand them clearly. Browse our list of services to see the many ways we can help your business. We provide conflict resolution, training and strategic management aid. Contact us to discuss any of our available workshops in further detail. 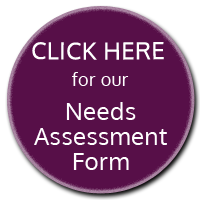 You can also fill out our needs assessment for a better consultation focusing on your unique situation. Facilitation – Whether you need help running a contentious meeting, some ideas for helping a board or committee run more smoothly or have a few people not getting along, we can facilitate meetings and give you strategies to run more effective meetings in the future. Mediation – We are trained, experienced mediators who can come to your site or other neutral location to assist people in working out an existing conflict. Arbitration – We listen to all sides of a conflict and can render a decision, so you can save time and money in court costs and get back to business. Strategic Planning – Whether you are revising an existing plan or just starting out, we have creative, interactive methods to get everyone’s input so you can be the best at what you do. Conflict Coaching – If you or someone you know is stuck in an ongoing conflict, we can provide one-on-one coaching to improve the situation. Conflict Resolution System Design – What happens at your work place when there is a conflict? Let us create a unique system that helps your business handle conflict effectively at all levels, so your company can be more productive. Classroom Management – If you are a school administrator or teacher who knows someone who needs help in running their classroom smoothly, let us work with them so they are less stressed, they can teach and their students can learn more effectively. Train-the-trainer – Do you have a subject that you need to teach others? Let us show you how to turn virtually any material into fun activities that people will remember! Nutrition Counseling – We provide motivational counseling to help you improve your health.